Compton is a hip-hop album by Dr. Dre that was released on August 7, 2015 on the Apple Store and on iTunes. The hard copy was released on August 21, 2015 to the public. Compton is the follow-up to Dr. Dre’s second album (named 2001), which was released in 1999. Production of the album began in 2011, and it took place at several recording studios. Compton features several rappers, including Dr. Dre, Kendrick Lamar, Snoop Dogg, Eminem, Cold 187um, The Game, Xzibit, and Ice Cube. Compton debuted at number 2 on the US Billboard 200, selling 295,000 units in its first week. Compton received positive reviews from music critics. The album contains 16 songs, including the two singles “Talking to My Diary”, and “Talk About It”. 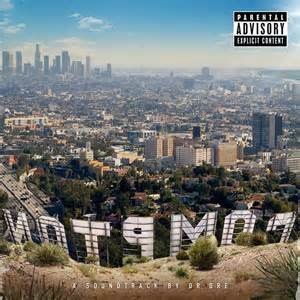 After 11 years of development hell, Dr. Dre announced his final album, Compton, will be released on August 7, 2015. Originally called Detox, which was scrapped due to Dr. Dre believing it did not meet his standards, Compton was heavily influenced by the 2015 movie, Straight Outta Compton.